A bilingual writer’s reflections on the rewards of a life shared between languages. I have been trying to write about what happened to me when I was 13 years old and growing up in a small town in Austria. It is the story of my brother’s death and my own survival. People ask me why I don’t write this story in German, but even now, more than 35 years later, I can still only write it in English. A curious thing happened almost as soon as I set foot in this country: I began to feel more free, more like myself, and even though the story I have been trying to write didn’t happen in English, it was in this language that I was first able to speak of it. When I came to America 27 years ago to continue my acting and theater training, American English came quite naturally. Once I was able to deliver a joke with the punch line and get a laugh out of people, I knew I had a pretty good grasp of the language. My new theater classes allowed me to express myself more authentically, and English became the language in which I struggled, for the first time, to find my own voice, at first through improvisation and later through writing my own performance material. I was more comfortable in my new language—it fit who I was becoming. 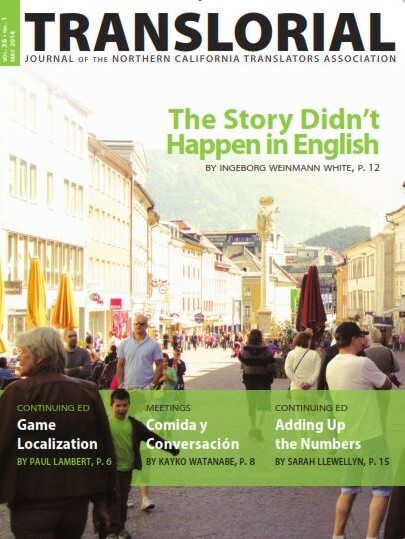 Immersing myself in English was like sinking into a soothing bath and emerging to live more fully. It was in this country and in this language that I began to think of myself more and more as a writer. “Where are you from?” The woman, whose dog is sniffing mine, looks at me with curiosity. We are standing on the paved path along the waterfront at Berkeley’s Cesar Chavez Park. After our dogs’ leashes have been disentangled we exchange their names and ages. This question always irritates me. I feel so at home here, I think in English, and by now consider myself more American than Austrian in so many ways. “It is the same German,” I start to explain. But she interrupts. 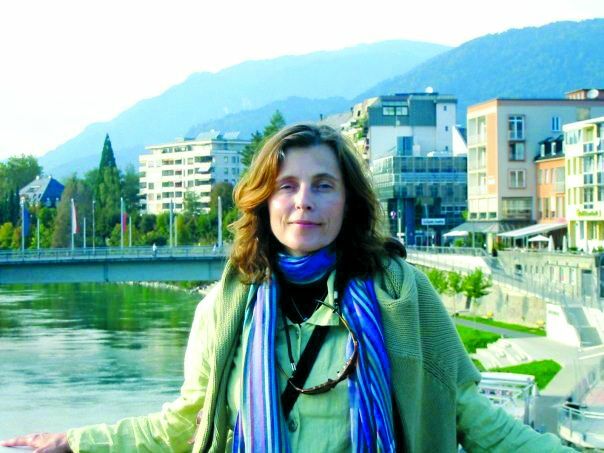 The author in her hometown, Villach, in Austria. Within the nine different states or provinces of today’s Austria, nine distinct dialects are spoken. The state where I was born and grew up is called Carinthia and its dialect, music, and folklore were a big part of my childhood. The Carinthian dialect was the first language I heard and spoke as a child. I loved to sing the folk songs that reflected its yearning and mood. It was the dialect my beloved nanny used when she held me close or joked with me, and it colored the words my grandmother murmured to me when she tucked me in at night or when she showed me the old grainy black and white photo albums from her childhood on a large farm. But her rural accent disappeared as she recited long poems by Goethe and Schiller from memory, sounding just like the actress I longed to become. And when I hung out with my best friend in elementary school, whose family was from Northern Germany, I’d take on her way of speaking, which I secretly admired; it was the way people spoke in the books I read and in the movies I watched. Reading became my favorite pastime; I was the bookworm in the family. “Come and play outside, get some fresh air!” my mother would call up to my room on a beautiful sunny afternoon while I was sitting in my rocking chair or lying on my bed reading. As I got older, my fascination with the German language only grew. I’d memorize poems and quotes, I’d fall in love with various writers and their particular voice and use of language. I dreamed of being an author one day, writing, of course, in German. I learned English in school starting at age 10. I didn’t know then that it would become the primary language of my adult life. German is the language I learned to speak, read, and write first; the language that taught me how to love words, sentences, and stories. During my first few years in this country I hardly spoke German, except during phone calls with my family. English was becoming part of my unconscious. And as I settled into my new life, I delighted in deepening my knowledge of American English and its idioms. I began reading contemporary American literature the way I had read German literature; now I was devouring books in two languages. “The English language is always in motion, always evolving,” a British friend of mine once remarked, comparing her native tongue to French and German, which she found to be more rigid and set in their ways. This seemed to be a metaphor for my life. German became like a childhood friend who’d never left our hometown and still lived in her parents’ house. We had drifted apart and didn’t have much to say to each other anymore, yet we’d always know each other and our connection would never be broken. Today I’m happy that as a translator and interpreter it is part of my job to stay in touch with the German language and culture. I’m glad to have German and Austrian friends here in the U.S., and as much as I sometimes feel like a split personality when one or the other language rushes out of my mouth, I enjoy being able to express my thoughts and feelings in both. New neighbors just moved in around the corner and as I walk by their house, I see a man and his young child in the front yard. The man speaks German to his toddler. I address him in our native tongue, and his face lights up. I get a warm feeling in my chest. I’m home. It’s a different kind of home from my English speaking American home, but deep down it still feels more familiar. Two years ago I visited my father in Austria before he died. For several weeks I spent the afternoons with him in the hospital, and what he enjoyed most was my reading to him. I could tell he loved hearing my voice, the way I pronounced the words in my best stage German. But when we talked we spoke in the everyday dialect we’d always used with each other. And when a new nurse came in to check on him he told her with triumph in his voice, “This is my daughter who lives in California… she speaks perfect German and English, and she even speaks Carinthian!” What a miracle, they both agreed, that I had not forgotten the dialect of my childhood. With my family it’s easy for me to slip back into this dialect, this language I was born with—it is deep and primal, private and far away, and I often wonder who I really am when I try to speak it. In the hours before he passed my father often looked at me as if he wanted to tell me something important. I could see that he was thinking about our story. I put my hand on his. And once he had closed his eyes and his breathing became more and more labored, the song I sang to him was not one of the folk songs from my childhood, but Amazing Grace, my favorite song of prayer, in English. I sensed that he, too, found it comforting. ein Sturm, oder ein großer Gesang? kim posted this article under Essays	on Thursday, May 1st, 2014 at 12:09 pm	You can follow any responses to this entry through the RSS 2.0 feed. Both comments and pings are currently closed.